If you love eating spicy tuna rolls or fresh salmon sashimi, then I’m sure you have wondered, "how exactly do sushi or sashimi chefs make precise slices of fish that perfectly melt in my mouth?" What Is Best Sashimi Knife You Can Get Online? 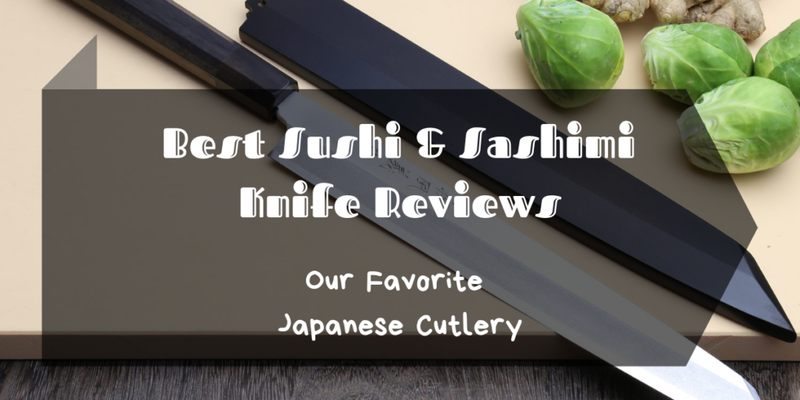 Before we get into my list of the 5 best sashimi knives in the market, let me first discuss the different types of sashimi knives that are often used by sushi and sashimi chefs in Japan. There are 3 types of sashimi or sushi knives used by sushi chefs all over the world: the Deba-bocho, Nakiri-bocho, and the Sashimi-bocho or Yanagiba. 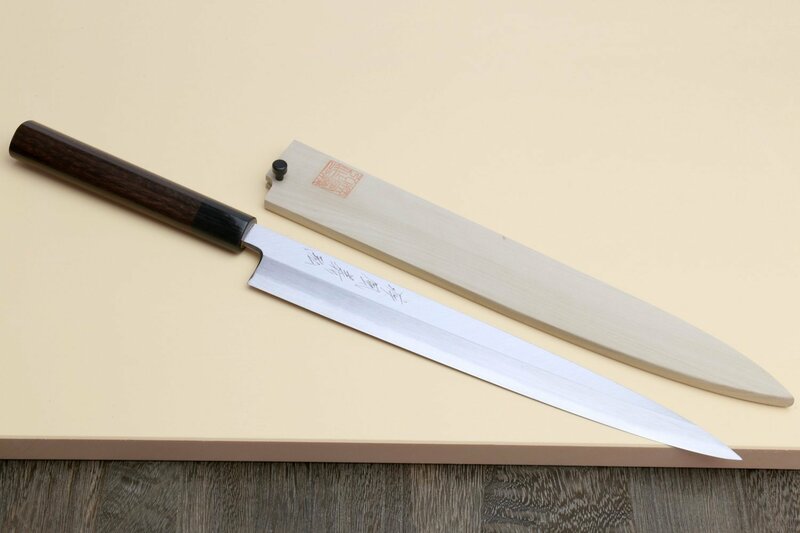 The Deba-bocho is basically a heavy-duty cleaver that chefs use for tough cutting jobs such as deboning and removing cartilage from the fish. This knife is designed with a curved edge to make removing fish heads a more seamless task. I guess you could somewhat assume that this knife is a cross between a vegetable knife and a meat cleaver. A Deba-bocho knife can come in different sizes ranging from short 4-inch ones up to 12-inches long. The blades that come with deba-bocho knives are usually thick and beveled on one side. It is specifically intended for deboning fish, which is why I don’t really recommend this type for home use unless you plan on preparing sashimi by getting the meat off a whole fish. 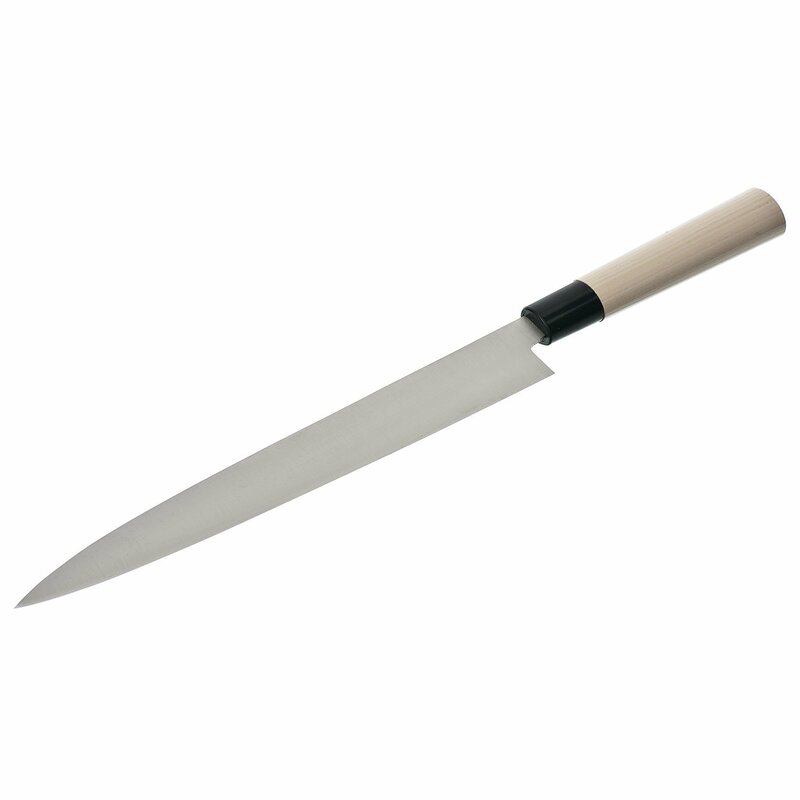 The nakiri-bocho knife is basically a vegetable knife that is ideal for chopping, peeling, and slicing. This knife is quite similar to the deba bocho since it also comes with a curved edge. However, it is designed with a double-edged blade and is more ideal for home use. The nakiri-bocho knife is also easier to master and to maneuver when it comes to making straight cuts. It also frequently comes with a black blade. The sashimi-bocho or the yanagiba knife is often used for cutting and slicing raw blocks of fish or fish fillets. This knife comes with a long and slender blade that has a single bevel on the right side. This is probably the best kind of knife that you can use to prepare sashimi and sushi. The sashimi-bocho is designed to make cutting a seamless experience. With this knife in your hands, all you really need to do is pull the knife from its heel to tip to cut through a block or fillet of fish. Now that you are familiar with the different kinds of knives that can be used to make sushi or sashimi, let us now get into the important factors that you should consider when it comes to choosing a sushi knife. Sushi knives can be bought for as low as 8 bucks and can be as expensive as a hundred bucks. Of course, it goes without saying that the more expensive a knife is, the higher its quality is. But this doesn’t mean that more affordable knives cannot perform well in the kitchen. At the end of the day, just make sure that you get a knife that will not break the bank. Sushi knives can be made with different kinds of metal including carbon steel, stainless steel, and composite steel. Each material has its fair share of pros and cons. A carbon steel sushi knife will provide you with the sharpest edge. However, it is a high maintenance material since it is highly corrosive. Carbon steel knives also require frequent sharpening. Stainless steel sushi knives, on the other hand, are more low maintenance. They do not rust and are very easy to clean. However, unlike carbon steel and composite steel knives, stainless steel knives cannot offer you a completely sharp edge. As for composite steel knives, they are not susceptible to rust and can have a sharper edge than stainless steel knives offer. The only downside to composite steel knives is that they can be quite expensive. Ever seen a sushi chef effortlessly glide a knife’s blade onto a thick slab of fish fillet to produce thinly sliced fish that can melt in your mouth? You can do that too if you have a knife like the Yoshihiro Shiroko High Carbon Steel Sushi Sashimi Chef Knife at your disposal. What I like about this knife is that it is often used by professional chefs, but it’s still a great choice for beginners who are seeking to make perfect cuts of sashimi. Another interesting feature of this knife is that it is made with Japanese white high carbon steel that can become extremely sharp once sharpened. The blade of this knife is 10-inches long and has a traditional grind. It also comes with a completely flat ground in front and a concave ground with a flat rim on its back. Its design is what allows it to seamlessly glide across thick slabs of filleted fish. This knife also comes with a sleek and elegant design that gives it a luxurious look. It comes with rosewood handles that are ergonomically designed and are just a delight to grip. Lastly, this knife is easy and simple to use. You will be able to cut fish precisely with this knife right out of the box. This 8-inch multipurpose chef’s knife is a great choice for novice sushi and sashimi makers because it can be used to prepare all kinds of ingredients such as meat and vegetables. This non-stick sushi knife is ideal for beginners because its non-stick build will allow you to effortlessly cut through fish meat. What’s great about this piece is that it is made with high-quality stainless steel that is durable enough to last for many years to come. Another interesting feature of this knife is that its non-stick coating not only allows for seamless cutting but also easier cleaning. It’s even completely dishwasher safe so you no longer have to worry about getting your hands dirty during cleanups. This knife also comes with highly ergonomic handles that make it very easy to maneuver during slicing. It even has a lightweight that will help you create precise cuts of fish. Be just like a professional sushi chef who can cut precise slices of fish for sushi and sashimi with this JapanBargain S-1553, Japanese Yanagiba Sashimi Sushi Knife. This knife is ideal for both beginners and professionals who are looking for a knife that maneuvers easily to create thin slices of fish. What I like about this knife is that it is made with Japanese white high quality steel that can become extremely sharp once sharpened. 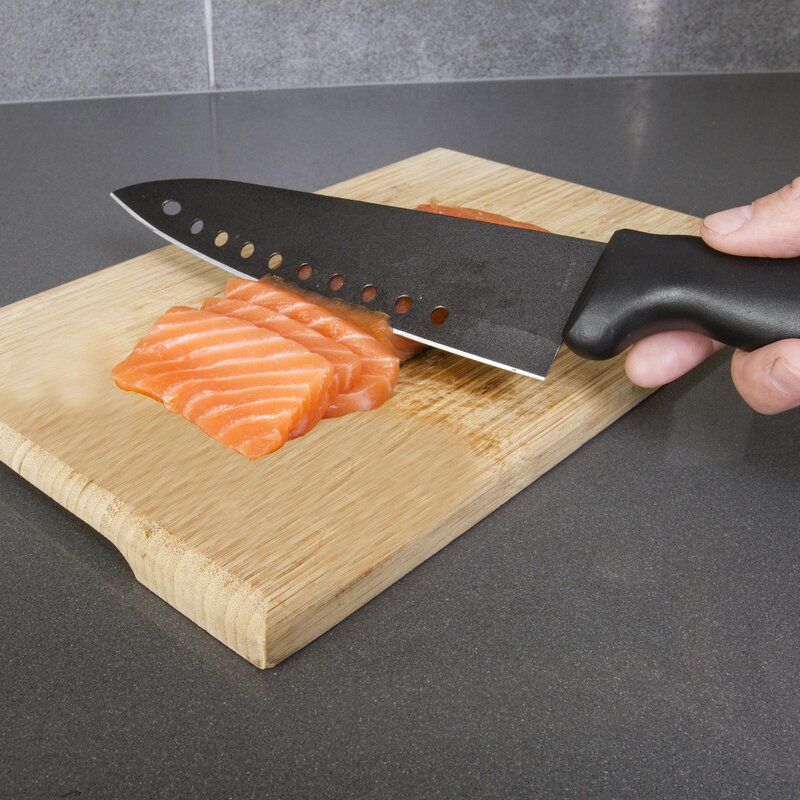 The blade of this knife is designed to go through fish fillets with ease. With this knife at your disposal, you will be able to create fine and thin slices of fresh fish without having to exert much effort. Another thing that I like about this knife is that it isn’t hard to clean or maintain at all. To clean it, all you really need to do is hand wash it and wipe it dry before storing. To maintain its sharp edge, you simply have to sharpen it twice a year and align its blade with a honing rod before every use. This Kai Wasabi Black Yanagiba knife is another great choice for any home cook who wishes to create fine sashimi and sushi dishes at home. 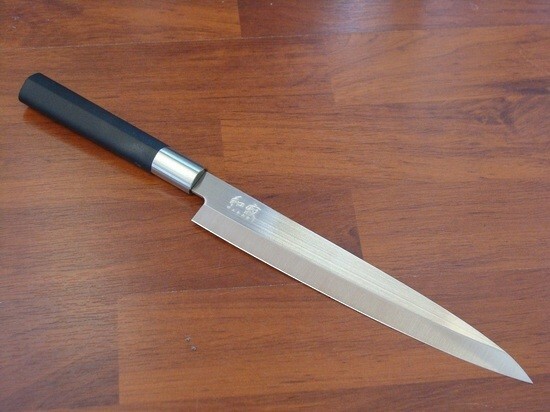 With this knife at your disposal, you will certainly learn how to perfectly cut sushi and sashimi in no time. What’s great about this yanagiba knife is that it is very easy to use and move around. It comes with highly ergonomic handles that are very easy to grip. If you’re looking for a knife that will help you get thin and fine cuts of fish, this one is definitely the best choice for you. Another interesting feature of this knife is that it is made with high carbon stainless steel that is not only highly durable but has an ultra-fine edge retention as well. What I personally liked about this product is its very attractive design. Its blade is even etched with Japanese characters that translates to “Wasabi.” The blade of this knife has also been bead blasted for a very attractive finish. Lastly, this knife is super easy to clean and maintain. It is completely dishwasher safe and is totally backed by a limited lifetime warranty that you can rely on if you ever encounter any issues concerning fixes and replacements. Another highly durable and low maintenance sushi knife that I have included in this list is the Mercer Culinary Asian Collection Yanagi Sashimi Knife. What makes this knife a great sashimi knife is its high carbon no-stain German steel build. Its blade is highly durable and can withstand corrosion and discoloration. It’s truly a knife that will last for years to come. Another thing I like about this knife is its highly ergonomic handles. Its handles aren’t just easy and comfortable to grip but is completely non-slip as well. It is certainly one of the safest sashimi knives in the market today. Aside from ergonomics and function, this knife also comes with a very attractive design. It has this stone finish that makes its blade look rustic and luxurious at the same time. If you are looking for a sashimi knife that is affordable, durable, doesn’t require much effort to maintain, has a very attractive design, is safe to use, is ideal for beginners, and feels professional to the touch, then look no more because this one has got you covered. I know all these sushi knives seem like great options but if you want to narrow down your decision to just one, let me help you out. For inexperienced home cooks who still has a long way to go when it comes to knife-handling and sushi-making, the Yoshihiro Shiroko High Carbon Steel Sushi Sashimi Chef Knife is your best choice. It is beginner-friendly, so it should be a fail-proof tool in getting thin slices of fish. Removing heads of fish can only be easy when you have the best sushi knife like the Kitchen + Home Non Stick Sushi Knife. It proved to be of top quality for the job. Get the Kitchen + Home Non-Stick Sushi Knife if you are looking for a more versatile knife that functions more than just a sushi knife. You can use it to slice veggies and other types of meats as well. For those on a tight budget, the Japan Bargain S-1553 Japanese Yanagiba Sashimi Sushi Knife won’t fail you. It might be cheap, but it packs a punch when it comes to features and advantages. If you want to achieve precision, Kai Wasabi Black Yanagiba Knife is your ally. You can make the prettiest cuts on your fish. For a knife you can rely on for a long time, Mercer Culinary Asian Collection Yanagi Sashimi Knife is a good choice. It is made from highly resistant materials, so you can get more uses out of it. Need more help in finding the right kitchen and cooking tools? Go to our homepage and check out more product reviews and suggestions so you can have the most reliable equipment and tools for cooking at home.